After over 25 years of martial arts practice (kung-fu, taichi, wing-chun, capoeira, judo...), Pierre discovered Systema and finally encountered what he was looking for... a free and realistic discipline focused on principles, instead of prescribed techniques and repetitions. 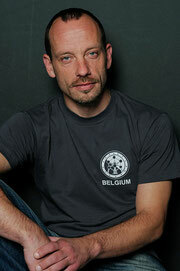 Since then he hasn't stopped training at Systema Belgium and taking part in seminars in Belgium and across Europe. Pierre Wattiaux is certified Instructor by Vladimir Vasiliev. Systema Brussels is officially approved by Vladimir Vasiliev, Director and Chief Instructor of Systema Headquarters, Toronto, Canada. We practice the Russian Martial Art as taught by Vladimir Vasiliev and Mikhail Ryabko. Systema Brussels is affiliated to Systema Belgium.